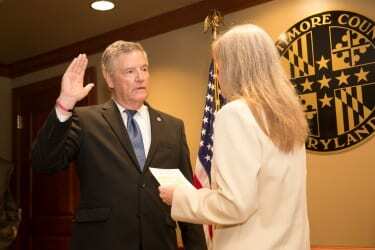 Don Mohler was sworn in as Baltimore County Executive on Tuesday morning. Mohler was officially sworn in as the thirteenth Baltimore County Executive by Julie Ensor, Clerk of the Court, at the Towson courthouse. Mohler was unanimously elected to fill the void left by the sudden passing of County Executive Kevin Kamenetz at age 60 earlier this month. Mohler had previously served as Kamenetz’s chief of staff and as communications director under former County Executive Jim Smith.